An ideal and versatile outdoor solution to making storage simple. 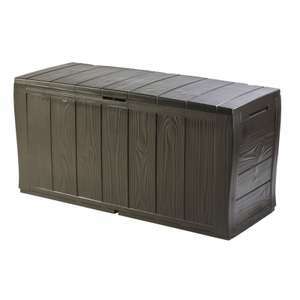 With its wide wood-panelled look, the Broadway storage box provides substantial storage (270 L/71 G) but is sized conveniently enough to fit on your deck or patio and has an attractive design that will co-ordinate with any style. This storage box is made out of a durable, weather-resistant plastic that keeps anything from garden tools and accessories to lounge chair cushions both dry and well ventilated. It comes with built-in handles and rollers for easy movement, easy to assemble. "Sorry, we can't find the page you're looking for! Were you looking for any of these pages?" Looks similar to the one I got from Tesco Direct last year. One to avoid if the hinge design is still the same. Also Keter informed me they do not carry spares for the model I bought. Thanks OP, just bought two as I was only trying to remember where I bought my existing one from so this was timely. To echo the previous post though, I snapped one of the hinges putting my previous one together without applying much force so be very careful when exerting any force to click it in place. Flimsy. How good enough as a place for amazon deliveries to go! These are very useful, I have similar to this from argos, been few years still doing well. I think that was the HollyWood version. That one has no mention of a weight limit for sitting on and after having purchased one myself, I can confirm that they are not to be used as seating. This one, "The Broadway" version, however is stable with my 105 Kilos on it. A friend bought one some weeks ago.